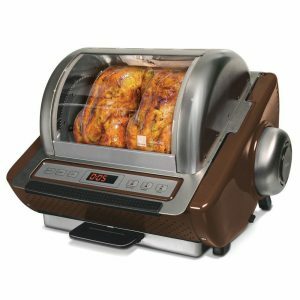 This modern number one release Ronco EZ-Store Rotisserie Oven is offered as part of the Ronco 5250 series. It scores 4.4/5 stars out of 445 ratings by a lot of happy customers. This specific model is in espresso color and you can get it in silver, red and blue through the offers on the Amazon product page. Or alternatively, you can check out the 4000 Showtime model which has a slightly higher price tag and a different design. You may also be familiar with the 5000 and 5500 models which are rectangular in shape and larger in size. 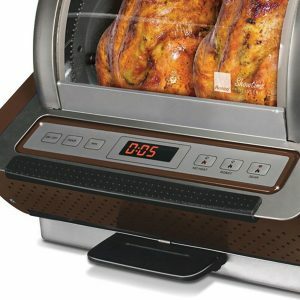 This rotisserie is rather easy to operate and will help you save on your energy bills by using about two-thirds of the regular conventional ovens. You can make a variety of healthy and tasty meals with it. The nice flavors will be locked in your meal with the self-basting rotation and the fat will be drained away into the drip tray. It is quite easy to disassemble, all the removable accessories are safe to be put in the dishwasher and you can easily clean the exterior with a damp cloth and soap. The glass lid comes off, you can remove the drip tray and pull out the curved plate behind the heating element. Ronco 5250 has the optimal preset temperature and precision rotation speed so you have the perfect roasts every single time. It has a compact size as an oven, weighs 17 pounds and measures 17 x 15.5 x 12.5 inches but you still may want to put it away if you’re short on space on your counter. It is perfectly easy store in the cabinets or somewhere convenient with its compact size (smaller than other Ronco models we have seen so far). The glass door will let you see what’s happening in the oven and monitor the process. You can roast chicken and turkey and cook fish, lamb chops, steak, cutlets, vegetables, and hamburgers with this compact rotisserie oven. You can make main meals, desserts, entrees, and appetizers. So it is not just about roasting chicken. With the three-hour auto timer, you can set the time for cooking in advance. In the box, you will get the Ronco Rotisserie Oven, an instruction manual with a recipe booklet, oven gloves, a carving platform, a detachable drip tray, a rotisserie spit, a multipurpose basket and food ties.The recipe booklet is not big but enough to get you started with this unit. You should be able to cook chicken or turkey of any size up to 15 pounds but the cooking time will vary between smaller and larger animals. For turkey, please dedicate between 12 and 18 minutes per pound. You’ll find the time guide for cooking items in the manual and take them as the minimum that you shall keep the chicken in the oven. Both turkey and chicken will cook very nicely, juicy and tender inside with a tasty and crispy skin. It is easy to remove the chicken once you’re done with cooking. Although it is easy to clean you do not have to do it after every single time you use this oven. Every once in a while is fine or when you see something that may smell bad etc. Please note that it is not super quiet and makes a bit of noise when cooking. It is a very well constructed rotisserie oven that is easy to use and works very efficiently making the best turkey and chicken you’ll ever have, looks good and the price tag is fair. We do not hesitate to recommend it to those on the market for a compact yet efficient electric rotisserie oven.